Large suction pad on the plat tray ensures that tray is secured to surface. Age Suitability: 3 months *or when your child can support their own head-12 months+ Approx. 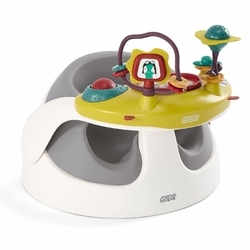 Baby Snug play tray offers 8 interactive features and 6 different toy arrangements to grow with your baby. Great for keeping your little one entertained while they learn to sit up unaided, particularly when you're out and about! Suitable from birth. Fixed toys can't be dropped or thrown by baby. Large suction pad ensures that tray is secured to surface. 6 different toy arrangements to grow and develop with your child. 8 interactive tray features including roller bead ball, spinning flower, twisty bendy stalk with rattle and teether, reversible squeaker pad, rotating lion and beaded loop.